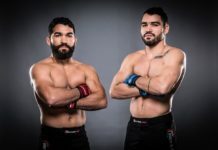 While he acknowledges featherweight champ Patricio Pitbull has had some great wars in Bellator, A.J. McKee is chomping at the pit… er, bit, and cannot wait to get a shot at his rival. Los Angeles — A.J. McKee’s good friend and training partner Aaron Pico is in the co-main event at Bellator 214 this weekend. Which means McKee is on hand in L.A., lending his support. Yet although he’s not fighting this weekend, there’s always the question of when ‘The Mercenary’ will finally get a crack at the featherweight title. After all, at 13-0, his resume speaks for itself. 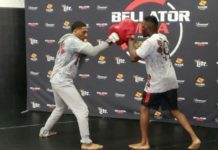 McKee spoke to Cageside Press ahead of Bellator 214, and gave the lowdown on Pico, and some words on 145lb champ Patricio Pitbull as well. McKee and Pico share a division (and a coach, McKee’s father Antonio), and should the time ever come where they have to face off — well, they won’t. McKee would simply move up to lightweight. But realistically, it’s McKee who is first in line for the belt. The young star has been gunning for Patricio Pitbill for a while now, and while Pitbull had kept silent in the past, of late, he’s been a little more talkative on social media. Accusing McKee in particular of being fed handpicked opponents, while Pitbull himself looks to move up in weight for a crack at the lightweight title. Hopefully, that opportunity will come sooner rather than later.